Fun, colourful and bright, the Costa Mediterranea cruise will enchant you as soon as you enter the main Hall, with its panoramic glass lifts and sculptures of dancers. And up above, a glass ceiling with views of the sky. Costa Mediterranea is Italian elegance, refined in its details, with many works of art, inspired by the style of noble Italian palaces of the 16th and 17th centuries. The Argentieri Restaurant is particularly stunning, with its balcony and 139 works of art made of silver. And for those who love sport, there is a large and dazzling gym on three floors overlooking the sea, and a multi-purpose sports court on the top deck. 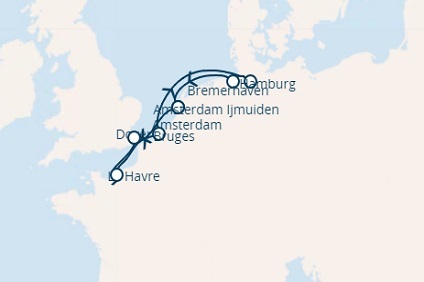 7 Night Cruise sailing from Ijmuiden to Amsterdam aboard Costa Mediterranea. 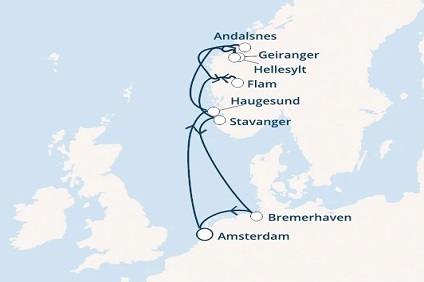 7 Night Cruise sailing from Amsterdam roundtrip aboard Costa Mediterranea. 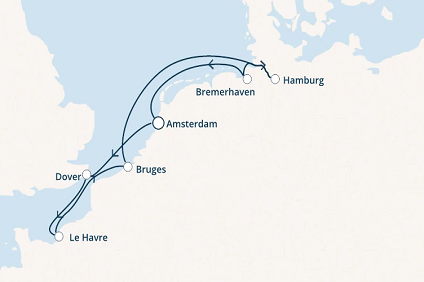 9 Night Cruise sailing from Amsterdam roundtrip aboard Costa Mediterranea. 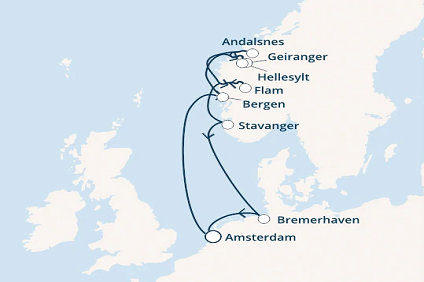 14 Night Cruise sailing from Amsterdam roundtrip aboard Costa Mediterranea. 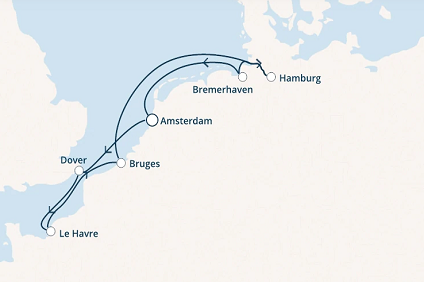 9 Night Cruise sailing from Amsterdam to Ijmuiden aboard Costa Mediterranea. 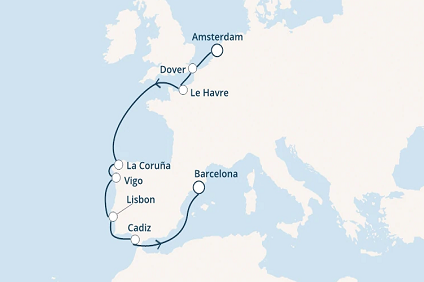 9 Night Cruise sailing from Amsterdam to Barcelona aboard Costa Mediterranea. 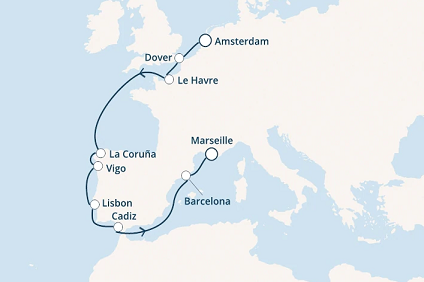 10 Night Cruise sailing from Amsterdam to Marseille aboard Costa Mediterranea. 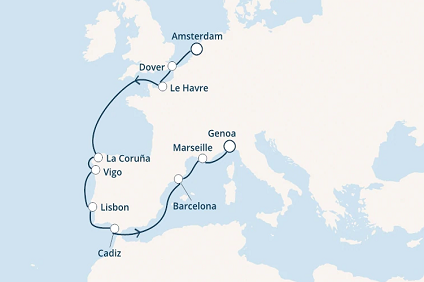 11 Night Cruise sailing from Amsterdam to Genoa aboard Costa Mediterranea. 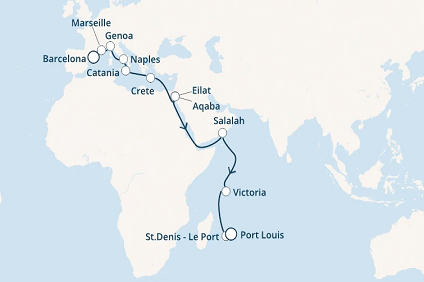 25 Night Cruise sailing from Barcelona to Port Louis aboard Costa Mediterranea. 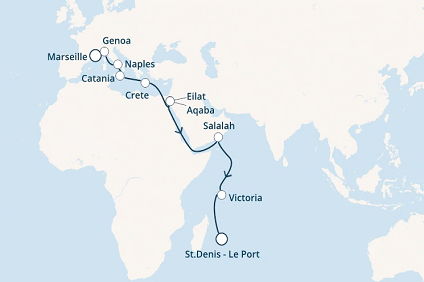 22 Night Cruise sailing from Marseille to St Denis aboard Costa Mediterranea. 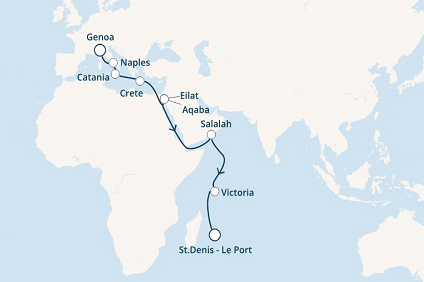 21 Night Cruise sailing from Genoa to St Denis aboard Costa Mediterranea. 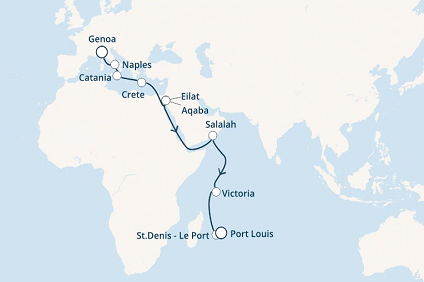 23 Night Cruise sailing from Genoa to Port Louis aboard Costa Mediterranea. Grand Suites GS feature two lower beds, which may convert to a queen bed, private veranda, sitting area, whirlpool bath, private bathroom with shower, television, minibar, minisafe, air-conditioning, telephone, and hairdryer. veranda. Aft: 367-sq.-ft. suite. 282-sq.-ft. veranda. Midship: 372-sq.-ft. suite. 118-sq.-ft. veranda. Panorama Suites PS feature two lower beds, which may convert to a queen bed, private veranda, sitting area, whirlpool bath, private bathroom with shower, television, minibar, minisafe, air-conditioning, telephone, and hairdryer. Aft: 270-sq.-ft. suite. 277-sq.-ft. veranda. Midship: 270-sq.-ft. suite. 90-sq.-ft. veranda. Oceanview Suites with Veranda S feature two lower beds, which may convert to a queen bed, private veranda, sitting area, whirlpool bath, private bathroom with shower, television, minibar, minisafe, air-conditioning, telephone, and hairdryer. 272-sq.-ft. suite with 80-sq.-ft. veranda or 360-sq.-ft. suite with 40-sq.-ft. veranda. Oceanview Staterooms with Verandah feature two lower beds, which may convert to a queen bed, private veranda, private bathroom with shower, television, minibar, minisafe, air-conditioning, telephone, and hairdryer. 175-sq.-ft. stateroom. 70-sq.-ft. verandah. Premium Cabins are privileged cabins in terms of size and position. 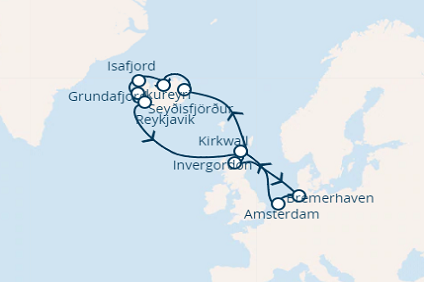 Located on the upper decks of the ship they provide extra comforts, including free continental breakfast on request, served in your cabin, free service in your cabin (24-hour room service) and the option to book dinner for a specific time in the restaurant. Oceanview Staterooms with Verandah feature two lower beds, which may convert to a queen bed, private veranda, private bathroom with shower, television, minibar, minisafe, air-conditioning, telephone, and hairdryer. 175-sq.-ft. stateroom. 60-sq.-ft. verandah. 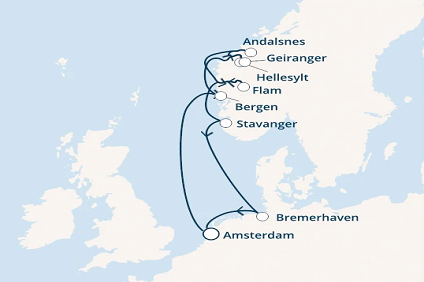 Classic Cabins are located on the first decks of the ship; they offer the most affordable prices for each cabin type, providing all the comforts of a standard cabin and the freedom to enjoy all the services and facilities available on the ship. Oceanview Staterooms feature two lower beds, which may convert to a queen bed, private bathroom with shower, television, minibar, minisafe, air-conditioning, telephone, and hairdryer. 175-sq.-ft. stateroom. Premium Cabins are privileged cabins in terms of size and position. 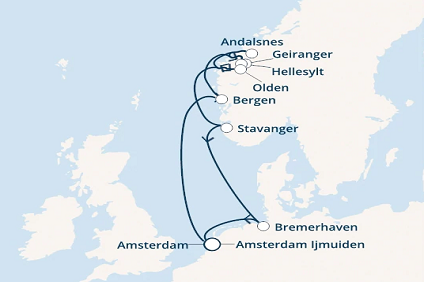 Located on the upper decks of the ship they provide extra comforts, including free continental breakfast on request, served in your cabin, free service in your cabin (24-hour room service) and the option to book dinner for a specific time in the restaurant. Oceanview Staterooms feature two lower beds, which may convert to a queen bed, private bathroom with shower, television, minibar, minisafe, air-conditioning, telephone, and hairdryer. 175-sq.-ft. stateroom. 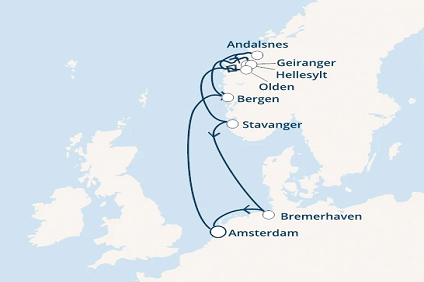 Classic Cabins are located on the first decks of the ship; they offer the most affordable prices for each cabin type, providing all the comforts of a standard cabin and the freedom to enjoy all the services and facilities available on the ship. Interior Staterooms feature two lower beds, which may convert to a queen bed, private bathroom with shower, television, minibar, minisafe, air-conditioning, telephone, and hairdryer. 160-sq.-ft. stateroom. Premium Cabins are privileged cabins in terms of size and position. 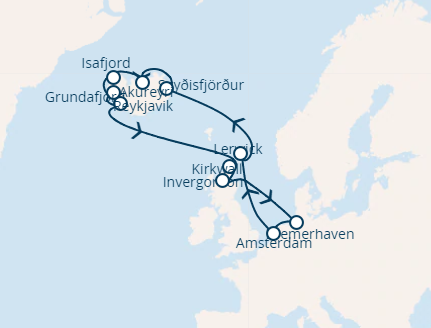 Located on the upper decks of the ship they provide extra comforts, including free continental breakfast on request, served in your cabin, free service in your cabin (24-hour room service) and the option to book dinner for a specific time in the restaurant. Interior Staterooms feature two lower beds, which may convert to a queen bed, private bathroom with shower, television, minibar, minisafe, air-conditioning, telephone, and hairdryer. 160-sq.-ft. stateroom. Classic Cabins are located on the first decks of the ship; they offer the most affordable prices for each cabin type, providing all the comforts of a standard cabin and the freedom to enjoy all the services and facilities available on the ship.